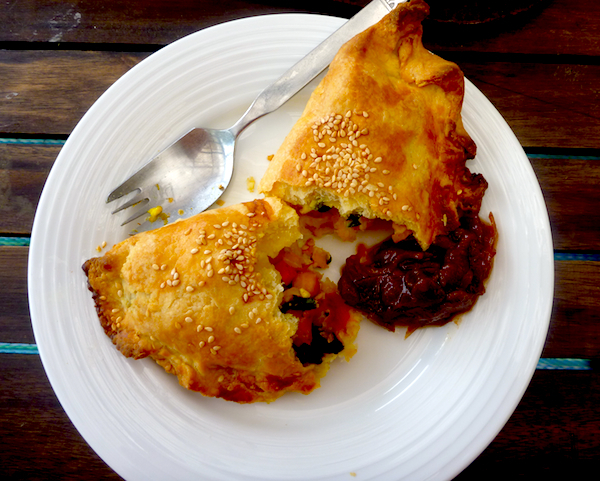 A couple of months ago when I was on my road trip through rural NSW, I had a vegetarian Cornish pastie from a bakery cafe and it was one of the worst things I’ve eaten for a long time – dense with potatoes, bland and stodgy. To add insult to injury, my brother said the steak and kidney pie he had from the same bakery was one of the best he’d ever had. That’s what happens when you try and branch out from the ubiquitous spinach and ricotta rolls in the regional bakeries of Australia. These vegetable pasties are my antidote to that road trip experience. There’s no potato, because I still haven’t recovered from the heaviness of that infamous Cornish pastie, and there’s some Indian spice to amp up the flavour. I made my own pastry because I was in the mood, but you could use ready-made puff or short crust pastry and they would be super quick and easy. The trick is to not overcook your vegetables, so the cauliflower is chopped into small florets and cooks while baking. 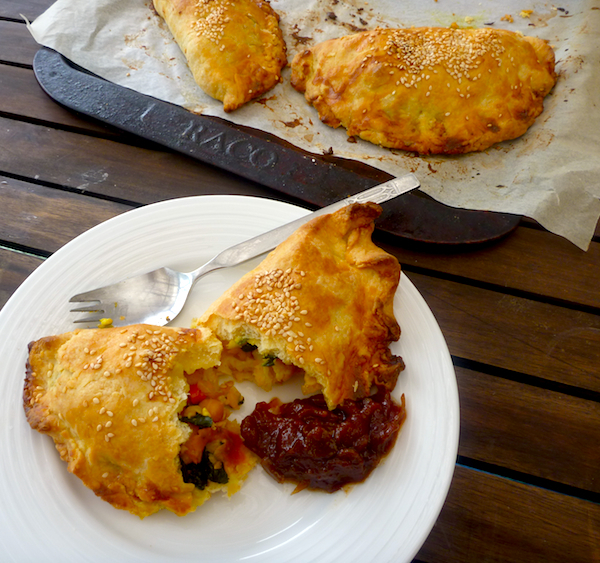 These were inspired by Jamie Oliver’s Indian-style Cornish pasties from Delicious magazine. I’ve substituted paneer cheese for his lamb, but ricotta would work equally well. Or, you could omit the cheese and make them vegan and perhaps add some ground almonds to give them a vegetable korma flavour. 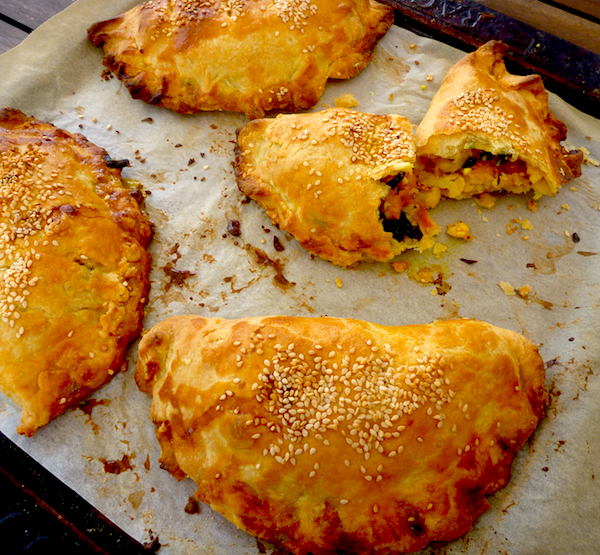 To serve with them, I opened one of my last jars of Parsi tomato chutney from last summer, which complimented these Indian spiced pasties a real treat. Heat oil in skillet. When hot, throw in curry leaves and mustard seeds and when seeds begin to pop, add onion, garlic, ginger, chilli and saute gently until onion is translucent. Add ground spices, cumin, tumeric and chilli powder, and cook for about 30 seconds until fragrant, add tomato and cook until it begins to breakdown. Then add chickpeas, coat well in tomato and spice and remove from heat, place in a large bowl to cool. Add cauliflower florets, coriander and ricotta or paneer cheese to chickpeas and add a dash of olive oil to dress it. (I had some spinach I wanted to use up, so I wilted it in a pan with some olive oil, drained, squeezed out the water, chopped it and added it to the mix as well). Allow to cool and make your pastry. Place flour and salt in a bowl, and rub butter through the pastry with your thumb and fingers, add water and press together into a dough (be careful not to overwork your pastry). Wrap dough in Gladwrap and rest dough in fridge for 30 minutes, then divide into eight portions, roll into balls and roll out into circles about 3 mm thick. Place filling in one half of the circle of pastry, with about one centimetre of space around the edge, brush edge with egg wash, fold over flap of pastry and crimp edges together. Brush tops with egg, and sprinkle with sesame seeds, if desired. Bake in a hot oven for 30 to 35 minutes until the pastry is golden brown. Serve with chutney or a dollop of beaten yoghurt. Yes a good pastry anything makes the world a better place. Pasties can go either way, can’t they? There’s nothing stodgy looking about yours though – the pastry looks so lovely and flaky! Oh yes, I’ve had a few country bakery vego failures myself! I’ve never thought to put paneer in them – brilliant idea. It can definitely lack imagination sometimes. Ahh the infamous country pastie strikes again! These on the other hand look fantastic, especially with that chutney! I’d probably add the potato back in because I can never say no to potato, but I can understand your hesitance! I did think of adding some kumara but resisted even that. Oh, that filling sounds savory and wonderful! There’s nothing a pastie to take you back.